Honoring Veterans with Housing — Heritage Housing, Inc.
We honor our veterans on Veteran's Day, but at the same time there are veterans who are living on the streets and emergency shelters, or who are chronically homeless. Those who served our country in the military deserve to have a home. According to the most recent statistics in Connecticut, in January, 2017 there were 34 veterans living in emergency shelters and 14 veterans who were unsheltered. These numbers are significant decreases from the past, which happened because of the priority that Connecticut politicians, policy-makers, and affordable housing developers have put on housing all veterans. Veterans in Connecticut who become homeless are now re-housed within 90 days, which has led Connecticut to be one of the first states in the country to end chronic veteran homelessness. Thank you to all who served our military and may we reach the point someday where all chronic veteran homelessness has ended across the entire country. 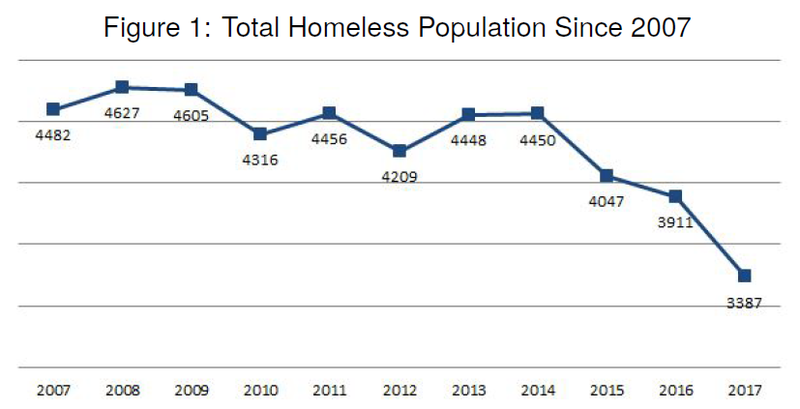 Graph showing Connecticut's total homeless population, 2007-2017.